Woodhouse Farm was built over 200 years ago and is a Grade II listed building. 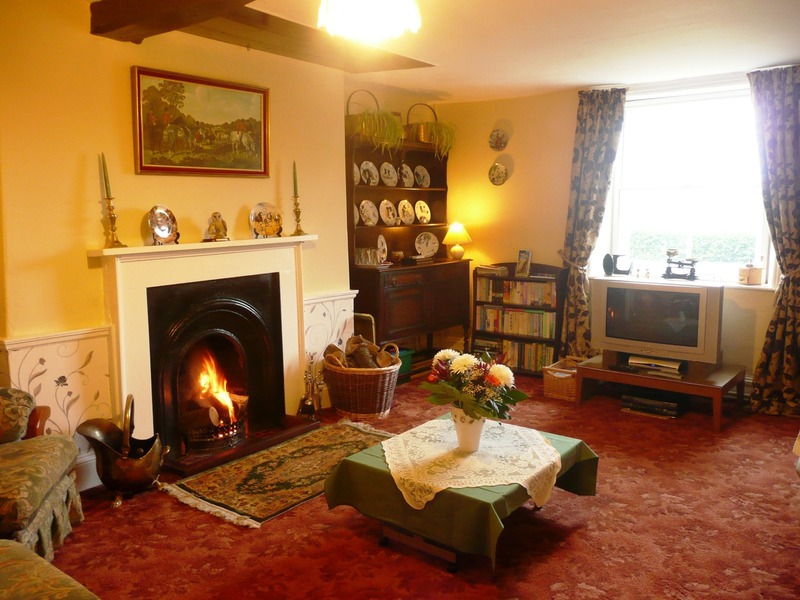 Many of the original features remain, such as oak beams and open fires. The spacious guest accommodation remains traditional while being a very high standard and offering all modern conveniences. 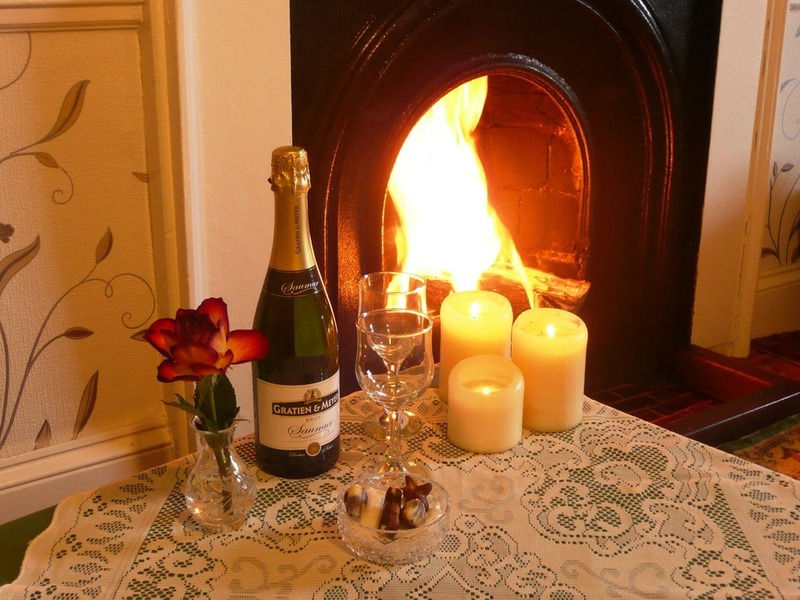 It is comfortable and homely, with a warm and friendly atmosphere ensuring a most enjoyable stay for all. All rooms are regularly refurbished. 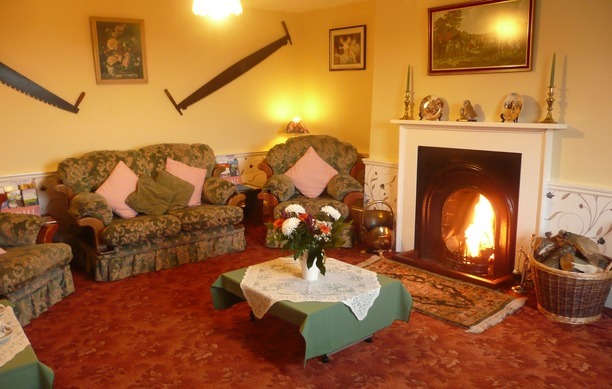 The Guests Lounge is relaxing and comfortable and offers widescreen satellite TV, video, DVD, books and games for all ages, local visitor information, menus for local restaurants and pubs, maps to borrow and there is also tea and coffee making equipment for guests to enjoy. 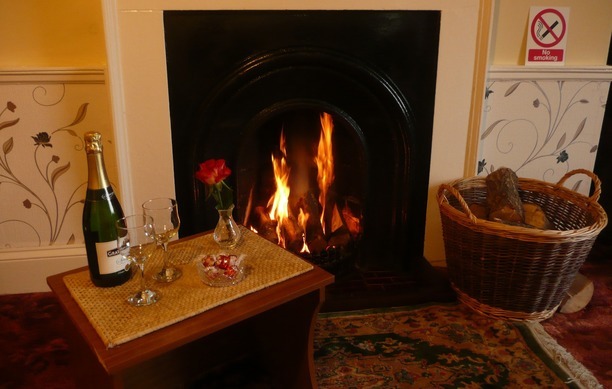 The room has original oak beams, open log fire, and stunning views to the south of our farm and the nearby Yorkshire Wolds. Making it a really lovely place to relax. 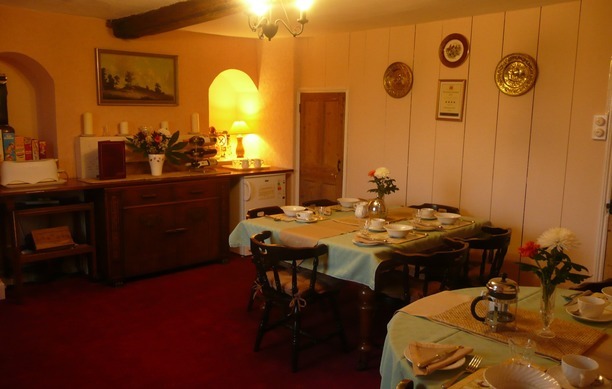 Breakfast is a treat, home cooked to order in the traditional farmhouse kitchen. From full English breakfast to smoked Haddock or cereals, yogurts, muesli’s and toast, all tastes are catered to. Homemade bread, jams and marmalade are a specialty with homegrown produce used whenever possible, and all other products sourced as locally as possible. Naturally all our eggs are laid by our outdoor hens which are housed well away from the house to avoid early wake up calls from the cockerel!. Special diets such as vegetarian and diabetic can also be catered for (notice in advance please). We are very proud of our breakfasts, the AA having rated our breakfasts as 5 star, and this year we have achieved the AA Breakfast Award. This puts our breakfasts as among the best in the country, and is awarded to establishments providing breakfasts “of a very special, high quality, with emphasis on freshly prepared local ingredients”. The separate dining room is large and spacious and has a fridge for guests use. 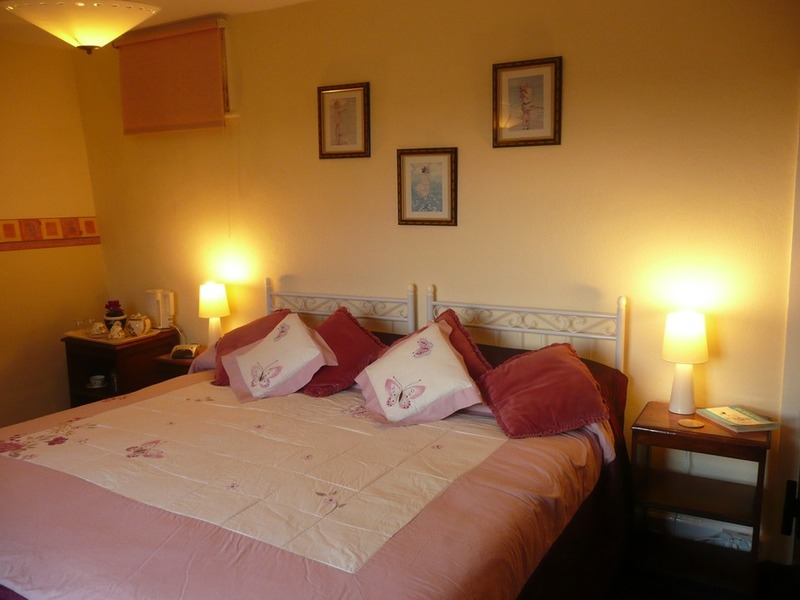 Accommodation consists of large spacious en-suite rooms, both with king sized beds. 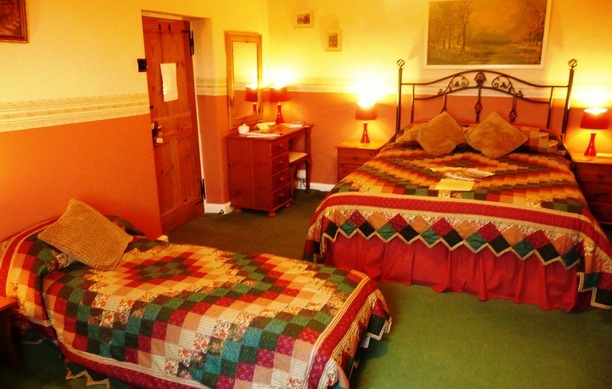 The double room can be made up into a super king sized bed, or a twin bedded room, just let us know your preference. The family room has a king sized bed with 2 folding futon chair/beds as required. All rooms are fully central heated and decorated to a high standard, with towels and robes for guests use. Both rooms are well equipped with en-suite shower rooms, digital safes, ironing facilities, remote control freeview TV, clock radio, hairdrier and shaver point, tea, coffee and chocolate making facilities, with complimentary biscuits and toiletries. Clothes drying facilities and shoe cleaning equipment are also available. 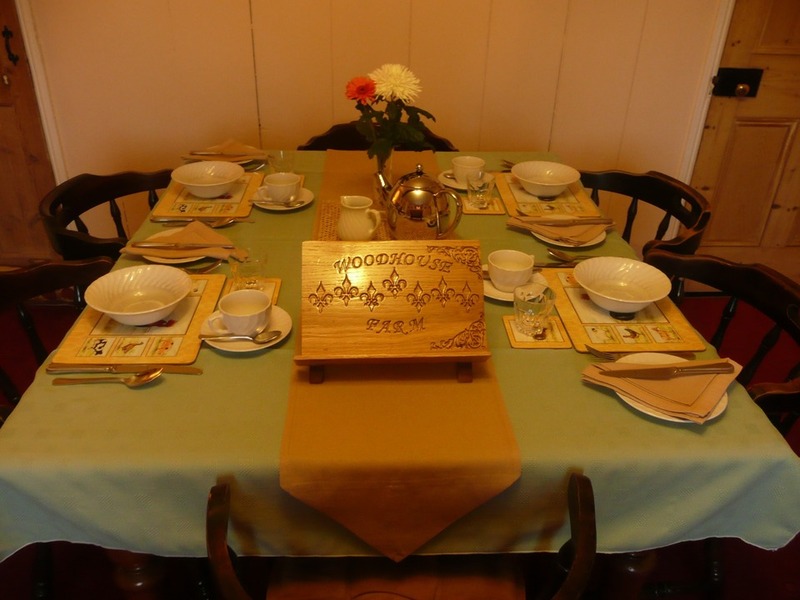 Well behaved children are most welcome and cots, high chairs, and other facilities are offered. Heading East on the A64 from York (towards Malton and Scarborough), at the top of the big hill (Whitwell Hill) turn right for Kirkham Priory (There is another turn a few hundred yards along if the first one is missed). Drop downhill towards Kirkham (over railway and river) past Priory on right, up and out of the village on the same road passing the Stonetrough Inn on the left. Stay on this road – very twisting and narrow – until you reach a T-junction at Westow. Turn right and carry on through the village – Blacksmiths Inn pub on the left. Travel on through village and up a smaller hill, down the other side onto relatively straight piece of road. Where the road begins to bear left, our farm drive is on the right. Woodhouse Farm is 3 fields in land from the road, next to large wood. Approx 1 mile out of village. Could guests please arrange arrival times with Sarah (either via e-mail or telephone) to avoid delays, as we can be working in the fields at short notice.